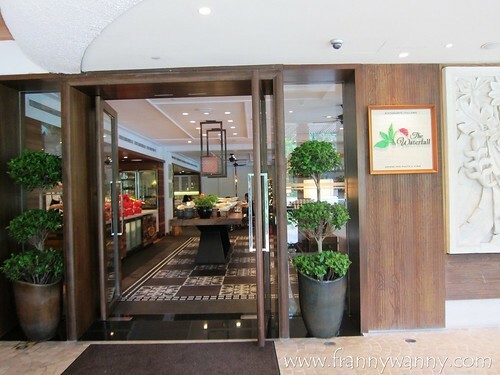 One fine day, Paul and I decided to head over to one of our favourite hotels here in the Lion City, Shangri-la Singapore, for a classy lunch. This came a few weeks after that relaxing weekend staycation that we had and since we failed to have breakfast at The Waterfall, we then make sure not to miss out on this opportunity to have lunch there instead. If you still remember, we had our 4th Anniversary dinner at The Waterfall where the Chef was sweet to create a special dinner menu just for us. We went there a few weeks before Christmas so they actually have a holiday-themed antipasti buffet set-up for lunch that day. 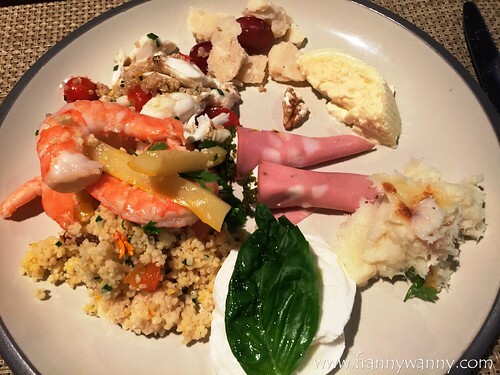 Don't expect a very wide spread but I can assure you that you're in for a treat as everything was definitely of top quality and I was so impressed with the different combinations that the Chef was able to come up with. My top picks were mostly the seafood-based salads such as the Prawn Salad with a generous amount of chilled prawns and couscous, another surprising discovery was the Baccala which is the Italian version of the Bacalao in Spain, this was prepared to look like a mashed potato but I love how the fish wasn't too salty and it had a nice creamy texture in every bite. Even the Crab Salad was really good. 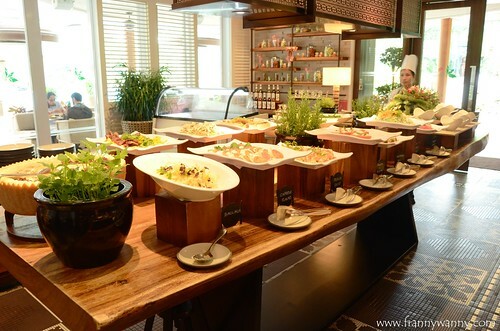 Other than those, I also love the fresh greens and the assortment of cheeses too. Note that this is just a buffet spread for starters. We haven't even gotten to our main dishes! Honestly though, I'd be happy just filling my tummy with antipasti. I just can't get enough of these unique salad combinations. So yummy! 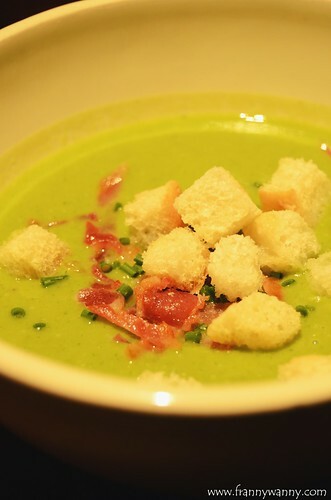 Paul loves soup and we filled a huge bowl with Cream of Green Peas. Errr.. okkkayyy, I don't really like green peas so a few spoonfuls were enough for me. It's not really my type but Paul enjoyed it as he loves the creaminess of the soup and thankfully there was no mushy texture one would normally get from eating green peas. Still.. I'd go with any other veggies than this. For our mains, we had the Spigola all Acqua Pazza. 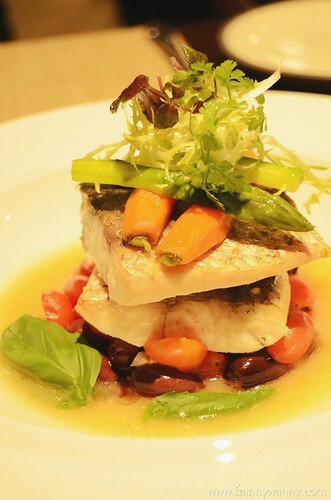 The Waterfall specializes in Italian cuisine and the Chef has done a marvelous job in creating this delicious sea bass dish which melts-in-your-mouth and is bursting with the freshest flavors. It's a perfect lunch choice as it's not very heavy yet it truly satisfying nonetheless. The fish was just so tender and the combination of olive, capers, tomatoes and wine was just heavenly. Next, we had the Linguine allo Scoglio. I love having pasta any day so I was so excited to try this. 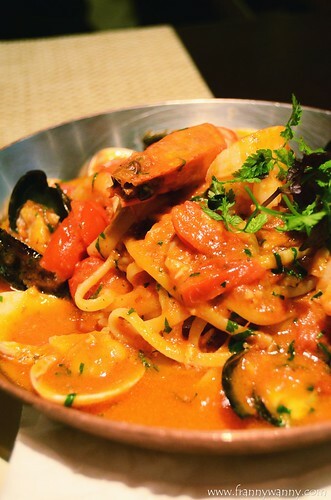 Once again, another seafood-loaded specialty which had prawns, scallops, mussels and clams all cooked with al dente linquine noodles in creamy tomato sauce. I skipped the shellfishes and focused more on the prawns and scallops which were cooked perfectly well. The last thing I want is to have mushy prawns or rubbery scallops. This is a very comforting dish which would be perfect to have on a really stressful day (or on any given day actually). As much as Paul and I share a lot of similarities, one thing that we just can't seem to sync up on is our choice of dessert. He loves anything with chocolates while I love caramel more. Come to think of it, the only dessert we both agree on is Strawberry Ice Cream! 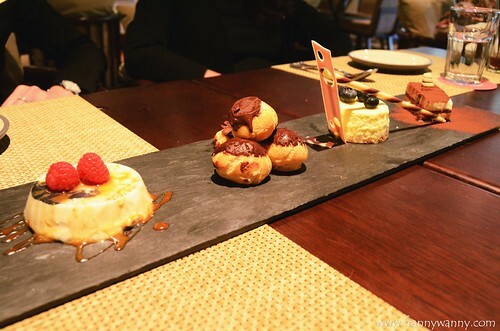 That said, we're so happy to be served with a dessert platter which comes in not one, not two but four mini dessert creations to perfectly suit our specific tastes. In our platter we got (from left to right): Biancomangiare, Chocolate Profiteroles with Lemon Curd, Ricotta Cheesecake and Tiramisu. I love the Biancomangiare the most as it's like a creamy almond-flavored creme brulee with a hint of citrus orange flavor from the syrup that's drizzled on top. Paul, on the other hand, happily enjoyed the Chocolate Profiteroles with Lemon Curd as well as the Tiramisu. We both felt that the Ricotta Cheesecake was a bit too rich and creamy for our liking. One small bite is enough. I really love going out on impromptu lunch dates with Paul and more so when we get to enjoy a delicious meal. This one definitely was one of the best workday lunches that I've had for 2015! Visit The Waterfall at Level One, Garden Wing of Shangri-la Singapore. 22 Orange Grove Road, Singapore 258350. Call them at 6213-4138 to make a reservation. Nice! The Linguine allo Scoglio looks delicious. And the dessert platter looks amazingly delicious too.